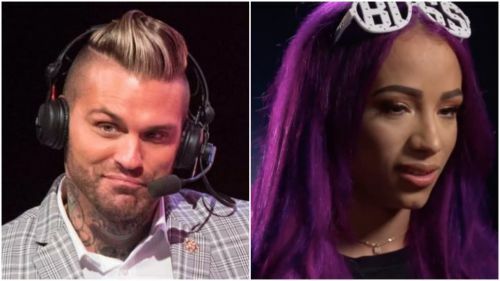 WWE News: RAW Commentary on Sasha Banks -"She's taken her ball and quit the game"
Corey Graves Vs. Sasha Banks in a war of the words! WWE seemed to take an apparent shot at Sasha Banks and the developing situation surrounding 'The Boss' asking for her release from WWE when Corey Graves, Michael Cole and Renee Young discussed it during Monday Night Raw's Superstar Shakeup. Sasha Banks was allegedly involved in a backstage altercation at WrestleMania 35 after finding out she and Bayley were set to lose the WWE Women's Tag Team Championship. This has led to 'The Boss' asking for her release from the company and refusing to come to work. Either this is all a storyline or WWE have taken this very real situation and turned it into a storyline as they had Bayley desperately trying to get hold of her partner but failing to do so on RAW. Bayley ended up teaming up with a debuting on RAW Naomi and together with the former SmackDown Womens' Champion, they made light work of the current WWE Women's Tag Team Champions, the IIconics. "We all know what really happened. She's taken her ball and quit the game"
It's very interesting that WWE would have their commentary team acknowledge Sasha Banks and Bayley being unhappy about losing the titles. It's even more interesting to have Corey Graves take an active and clear shot at Sasha Banks on live television in the way that he did. What do you think about WWE leaning in hard on the whole situation? Especially if it's true? Leave your thoughts in the comments section below!